Tamper-Resistant (TR) receptacles and covers to prevent shocks to children. Electrocution is the fifth leading cause of occupational injury and death in the United States, so ensuring that your building and its occupants are safe should be one of your highest priorities. Thousands of electronic and electrical appliances are used on a daily basis in a typical workplace. Whether it is a computer, coffee maker, or industrial appliance, unsafe use of or damage to equipment can cause serious injury from electrical shocks or fires. It doesn’t take much to cause an electric shock. The common 15 Amp circuit breaker can supply a minimum of 15 Amps continuously, and up to 100 Amps for short durations. 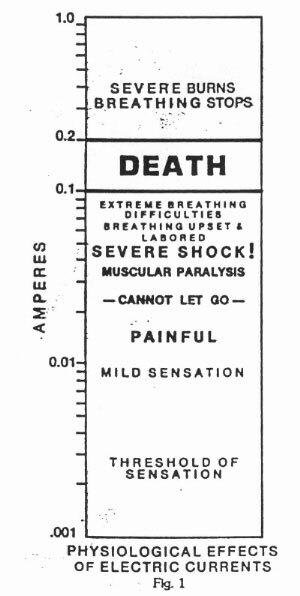 Yet electrocution can occur with as little as 10 milliAmps (0.01 Amp) of current. 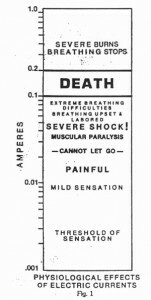 If current flows through muscle tissue, it can cause muscular contraction, which can make it difficult for the victim to let go of the shock source. If the current flows through heart muscle, it can stop beating (ventricular fibrillation), the most common cause of electrocution. 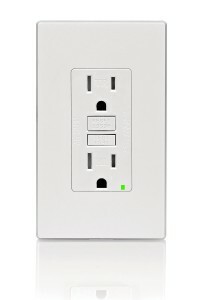 Ground-Fault Circuit Interrupter (GFCI) receptacles or circuit breakers should be installed where people can accidentally ground their bodies while using electricity. Electrical ground paths occur from standing on dirt or ground level concrete or from touching grounded metal pipes, duct work, or conduit. You can easily identify a GFCI by the presence of its “test” and “reset” buttons. GFCI protection must be placed between the power source and the hazardous location. Manufacturers offer GFCI protection in special circuit breakers, outlets, receptacles, extension cables, and appliance cords. To enable easy access for testing before use, GFCI receptacles are commonly installed in restrooms, kitchens, and other areas with a heightened risk of electric shock. Note, GFCI devices only protect against line-to-ground shocks. Tamper-resistant (TR) receptacles protect small children from shocks by either blocking access to live metal parts inside receptacles or by turning off electricity at empty receptacle sockets. TR receptacles work together with GFCI protection to provide good shock protection. TR receptacles help prevent Line-to-Neutral shocks not covered by GFCI Line-to-Ground protection. A mechanical TR receptacle closes shutters over the receptacle sockets on empty sockets. An electronic TR receptacle opens relay switches on empty sockets and closes them only after an electrical appliance plug has been inserted. Tamper-resistant receptacles can typically be identified by a “TR” mark on the face of the outlet, or by visually inspecting the outlet for the presence of plastic shutters just inside of the outlet openings (mechanical type). Some electronic TR receptacles use radio frequency identification (RFID) tags on plugs (also known as Shock Fault Circuit Interrupter) to keep electricity turned off at empty receptacles to prevent shocks. If no tag is present, the receptacle turns off electricity. If an RFID plug tag is detected, the receptacle turns on electricity for the appliance. To prevent electrical shocks and fires and to ensure that your electrical system functions reliably, your building’s wiring and cabling systems must be properly installed. In older buildings, existing wiring and cabling must be inspected for integrity and properly repaired as needed. Older electrical circuits may not be adequate for modern loads. Compare your building to the latest National Electrical Code® (NEC) requirements for grounding, bonding, and over-current protection needed to support modern loads. Usage, heat, corrosion, and arcing deteriorate electrical wiring junctions and devices and can lead to faults and fires. Therefore older electrical systems need to be regularly inspected by professionals and maintained to ensure their reliability safety. Maintenance includes the removal and replacement of damaged or worn wiring, receptacles, outlets, motors, transformers, luminaires, and circuit breakers. Electrical components do wear out. Improperly installed wiring, over-loaded wiring, or improper usage can all cause safety hazards. In contrast, properly installed and maintained electrical wiring and equipment will enhance electrical safety and reliability. Be sure to enlist the help of an electrician or other certified professional when assessing your building’s wiring and cabling. If electrical panels, light fixtures, receptacles, or switches are exposed to water from a leak or flood, have an electrician disable power to the device and replace the device with a new one. Mineral or salty water can conduct electricity, cause corrosion, and create a fire, shock or explosion hazard. For more information about how to evaluate water-damaged electrical equipment, you can can download a helpful guidefrom the National Electrical Manufacturers Association. Counterfeit products are becoming increasingly more common in the market. They look very similar to standard electrical products; however, they are sold at a much lower price. Proper labels and warnings are critical to protect your building and your building’s occupants from hazards. Make sure that all products, electrical equipment, temporary building construction project sites, and dangerous materials have the proper labeling to alert occupants of potential hazards. Examples of proper labeling include bright colored labels and signs and easy-to-understand symbols, safety barriers, and proper safety instruction and manuals available to operators of potentially dangerous equipment. For more information on proper labeling and warning methods, see the ANSI Z535 Safety Alerting Standards. Many buildings have electrical circuit breakers or fuses that help prevent fires ignitions from electrical overloads. Branch circuit breakers are designed to protect the thick branch circuit building wires, but not the thinner appliance wires. Out-of-Parameter Circuit Interrupters (OPCI) are designed to protect the smaller appliances wires from overloads. NEMA defines plug standards to limit the maximum current through a receptacle so that the appliance current does not exceed the branch circuit wire capacity. 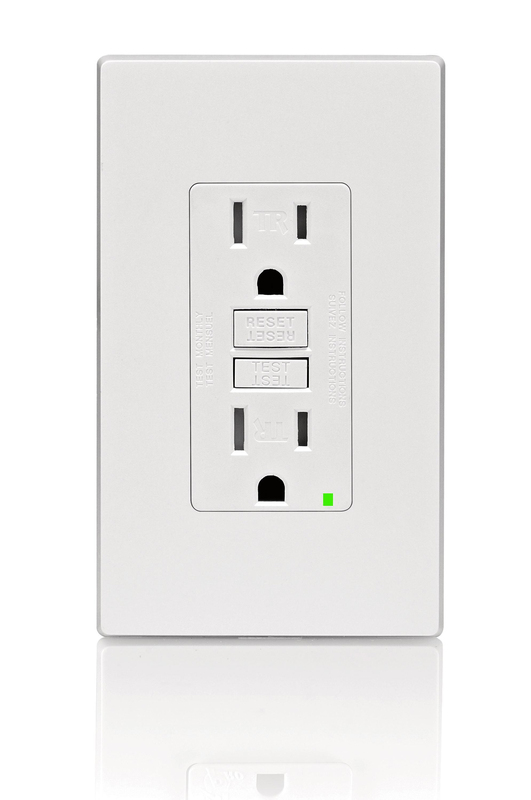 UL/CSA appliance standards require use of the appropriate shaped receptacle plug to match the maximum appliance load current. Some examples are shown below. For example, a 20A appliance plug (NEMA 5-20P) cannot fit into a 15A receptacle socket configuration (NEMA 5-15R). However, the US National Electric Code® (NEC) allows either duplex-receptacles per branch circuit and the Canadian Electric Code (CEC) allows for 12 duplex-receptacles per branch circuit. These electric codes recommend that total branch circuit loads do not exceed 80% of the rating (12A load for a 15A branch circuit; 16A load for a 20A branch circuit). For eight duplex-receptacles on a 15A branch circuit, a 1A load on each receptacle totals 16A and a 33% overload. 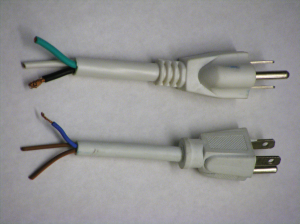 Use of just one 12A space heater consumes the entire ampacity of a standard 15A circuit, leaving no available current for the remaining 15 (US) or 23 (Canada) individual receptacles (maximum) on that branch circuit. Therefore, some smart receptacles offer a current limiting feature where the receptacle will disconnect power if plug loads draw more current than a limit threshold. The facility manager can set this limit threshold (e.g., 1A, 2A, 3A, 4A, 5A, etc.) for each receptacle independently. Occupants then need to choose energy efficient computers, printers, lamps and other office equipment so that their total does not exceed the trip level. This limit threshold feature prevents unauthorized appliances (e.g., space heaters) from tripping the circuit breaker and disrupting current to all the other users on that same branch circuit. If you think your electrical outlets or circuits may be overloaded, it is recommended that you hire a qualified electrical contractor or inspector to help you identify and address potential problems. Over the past five years, more than $14 billion in fire damages have been reported in nonresidential building fires, and these fires have resulted in approximately 440 deaths. The leading causes of these fires are heating, cooking accidents, equipment malfunctions, and appliance failures. With this thought in mind, it is important to protect both the occupants of your building as well as your investment. Fire safety is usually split into three categories: prevention, detection and suppression. Are all flammable materials safely stored away from stoves and other burning equipment? Is your building free of clutter, especially around heating units and furnaces? Are matches and lighters responsibly stored and out of reach of children? Are good electrical safety practices being used? All of these questions should be asked when performing a personal fire prevention assessment. In addition to a personal assessment, it is recommended to have a qualified professional to conduct their own assessment of your building to ensure the highest level of fire prevention. Does your building have smoke detectors that are part of a larger detector system, which reacts and alerts the building in case of an emergency? Is there a smoke alarm installed in every room and every level of your building? Does your building have proper alarm systems that enable sprinkler systems and communicate to fire protection agencies? You should ask these questions and more in order to maximize the fire detection capabilities of your building. In addition to a personal assessment, it is recommended to have a qualified professional perform their own assessment of your building to ensure the highest level of fire detection. To minimize fire damage and optimize occupant safety, it is necessary to suppress a fire at the moment it is detected. Proper steps can be taken to ensure that your building stands ready to limit a fire’s destructive path. Assess the places within your building that pose the greatest fire dangers and account for the most regularly populated areas of your building. Once these factors are recognized, make sure that proper extinguishing equipment is in place and in a good working order. Also ensure that a working sprinkler system is properly installed in your facility. These are quick and easy ways to eliminate a fire at the point of ignition. By keeping a fire from spreading through suppression, you’re helping to enhance the safety of your buildings’ occupants, their property, and your investment.